Last summer the Sisters Coffee roasting team traveled to Portland to hang out with Sustainable Harvest. A coffee importer focused on building relationships, trust, and sustainability throughout the coffee supply chain, Sustainable Harvest and Sisters Coffee have been working together for five years. We try to make it to Portland to taste coffees with the Sustainable Harvest team at least once a year, touching base and connecting along our own supply chain. During our January visit we rediscovered a coffee from the Peruvian cooperative Rutas del Inca. With a complex flavor profile and bursting with sweetness and fruit notes the Rutas was a standout on the table. The next week after our PDX trip I purchased the Rutas del Inca to offer in our Roaster Series. The Rutas was a resounding success, so during the spring we spent time discussing how to featuring it again in coming years. Proposing to work with a coffee year after year for Sisters Coffee means we endeavor towards a deeper relationship with the coffee’s producers and better understand the coffee’s supply chain. The Guatemala Finca Villaure La Basa and the Rwanda Nyampinga Women’s Coffee are great examples of this approach. Sisters Coffee features both coffees every year and we have visited with the producers in their homes and at their washing stations multiple times over the years. We strive to fully comprehend the coffee’s stories, understand the struggles facing the producers, and have a transparent supply chain from producer and coffee pickers all the way to our cafes in Oregon. As our discussion continued we quickly came to the consensus that we needed to visit the cooperative in Peru. After speaking with members of the Sustainable Harvest team and working out logistics, a few weeks later, just after the Sisters Rodeo, I headed down to Lima to visit Rutas del Inca with Sustainable Harvest and a group of other roasters. I was delayed arriving to Lima and with our flight to Chiclayo leaving early the next morning I managed to grab four hours of sleep before heading back to the airport. Two of our party were delayed in transit and had slept in the Quito airport, making it into Lima just in time to hop onto our flight to Chiclayo. At the airport in Chiclayo we met the rest of our group and we headed off to Querocoto, home of Cooperativa Agraria Rutas Del Inca. In Chiclayo, a haze hung in the air, heavy fog from the ocean had trapped in smoke from burning trash. The dry and rugged landscape reminded me of a dustier version of Oregon’s high desert, minus the ocean fog and burning trash. We left Chiclayo behind us and started ascending into the Andes, passing solitary mountains standing alone like towers poking through the smog. The further we ventured more and more mountains rose on either side and in front of us. Climbing steeply through the mountains we left the haze and fog, swapping it for sunshine, clean air, and a stunning Andean landscape. The Road to Rutas del Inca. The road to Querocoto follows an old Inca Chasqui path and is where the Cooperative’s name, Rutas del Inca is derived. Chasquis, as we were told, would run from the coast just west of Chiclayo to the Incan city of Pacopampa bringing food from lower lying lands and, most importantly, fish from the sea. The emperor demanded fresh fish every day, caught in the morning and on his plate by dinner at the latest. The Chasquis would run with a very heavy pack for as long as they could, eating coca leaves to keep them going, if they faltered or needed a rest causing the fish to spoil in the least they could be killed. Coffee in this region of Cajamarca is a fairly recent phenomenon, with larger scale production only taking place within the last decade. As the climates change around the world, the temperature in this region has stabilized, allowing coffee production at extremely high altitudes, sometimes over 2000 MASL. The road to Querocoto follows the old Chasqui path, winding ceaselessly as it climbs ten thousand feet in elevation. We made one short pit stop on the drive and six hours later we arrived in the small town of Querocoto. Upon arrival we quickly ditched our bags and headed up to the Incan ruins of Pacopampa perched on top of a nearby mountain. Incan architecture and masonry is amazing, as we climbed the mountain top we passed artifacts carved and shaped from a slabs of solid stone. 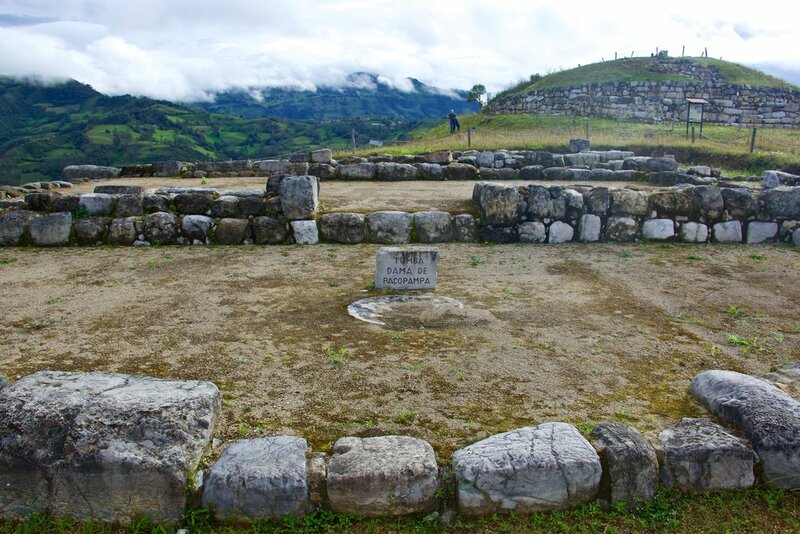 On the very top of the mountain the ruins of Pacopampa remain, the town of Querocoto is easily visible below and the name Rutas del Inca is fully realized. The next morning, after a surprisingly warm shower, we headed out to visit Andres and his farm in La Pampa. The road to La Pampa is along a steep valley, making its way down only to climb steeply before descending again to La Pampa. The road is littered with scenic vistas and waterfalls. During the rainy season the creeks and streams cascading down the walls of the valley swell making the roads impassable to cars and trucks. All goods and services needed in the little towns dotting the way to La Pampa must be brought in on motorbike or by foot until the road reopens. Coffee cherries at Andres’ farm. After a few photo stops, we arrived in the small town of La Granja where we all piled out of the van and crossed a small foot bridge spanning a small river. Once across the river we hopped into the back of a truck quickly covering the remaining distance to La Pampa. A small village tucked into the massive valley, La Pampa is set around a community soccer field with multi colored houses surrounding the field. The backdrop to the town is the green wall of the valley rising a couple thousand feet above the town. It was a stunningly beautiful place. Weaving between the granadilla and coffee trees. 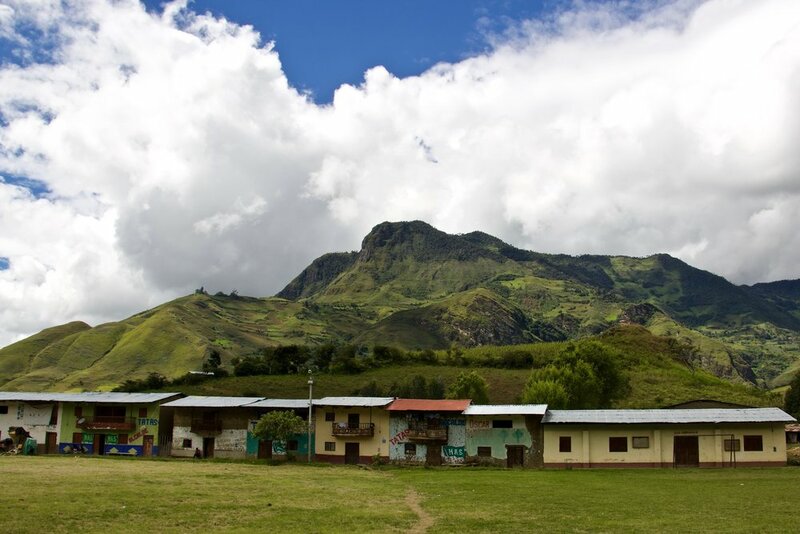 Coffee harvest at this location in Peru is from mid June to late July, with peak harvest occurring in mid July. We were seeing the first ripe pick of the year. Once harvested the coffee is processed at a small mill located at Andres’ house. The coffee is depulped and fermented for 15 hours before being washed. The temperature was around 70 degrees during our visit which is typical weather for the majority of the year in this valley, with the exception of the rainy season. The second of Andres’ plots was less intercropped, the trees were planted in rows and had established walking paths for easier cherry picking. After walking two plots our time was up and we had to hurry to meet with the cooperative. We thanked Andres and his family profusely, said goodbye, and started the drive back to Querocoto. Andres amongst his coffee trees. Mario of Cooperativa Agraria Rutas del Inca. Back in Querocoto the remainder of our day would be spent visiting with the Rutas del Inca Cooperative. Upon arrival to the office we met Mario the Cooperative manager. Sitting in a big circle we introduced ourselves and got to know some different members of the cooperative including farmers, agronomists, and the head of quality control. We were able to have a conversation with broken Spanish, supplemented with translations, about different aspects of the cooperative, its structure and makeup, also what we as roasters were hoping to see from the cooperative in the coming year. After conversing for almost an hour we broke up the meeting to go cup some coffee. The cupping room, at the top of a very narrow and steep staircase, was a small room with a singular light bulb for illumination. The floor creaked constantly and coupled with the light casting odd shadows everywhere, it felt like we were cupping in the hold of a wooden ship. As we piled into the cupping room the Rutas del Inca quality team was setting up the cupping. Once set, we pulled on aprons and got to cupping. Side note, the spoon I was using had a steep bend in the stem leading to the bowl which was quite deep, it felt as though one spoonful would have been equivalent to a full cup of coffee. Prepping the cupping table at Rutas del Inca. With 10 people participating in the cupping it took a while to compile notes and scores for all the coffees. We were constantly dodging each other to grab tastes of coffee. The coffees on the table were early indications of quality from different producers within the cooperative. The different levels of quality on the table made me appreciate the fantastic job Rutas does creating a uniform offering from such a diverse array of coffees. The cupping also provided insights as to whether a singular farmer’s coffee would do well as a single farmer offering from the cooperative. Freshly roasted coffee from the coop. Three samples stood out from the other five as the room favorites. All three had nice complexity, great acidities, and delicious flavor profiles. We talked at length about the different coffees asking what it would look like to separate out a lot from a specific coop member. Oscar, Director of Supply for Sustainable Harvest in Peru, broke down the processes for separating out individual farmers coffees as well as different proportions of the harvest. What we cupped was the earliest part of the Cooperative’s harvest and although there were some very good coffees on the table, they will not be combined with the coffee from the same trees later in the harvest season. After the cupping concluded we said our goodbyes to Mario and the other coop members. They were all so kind to us, truly amazing people. Sometimes at origin the amount of time you get to connect will be very short but the connection you can make in that time makes it well worth it. The hard work, dedication and passion that I witnessed firsthand in Peru from the cooperative and its member farmers only solidified our decision to continue to work with their coffee. Since returning home from that trip I have kept in close contact with Sustainable Harvest, eagerly awaiting news from Rutas pertaining to how the harvest progressed and how their coffees had been tasting. After some time we are pleased to announce that Sisters Coffee will indeed be featuring the main Rutas del Inca lot as well as an offering from a single member of the coop (details to follow). The single farmer offering has been a work in progress over the past year as the cooperative has set in place systems to be able to produce such lots, so I am very excited to be offering such a coffee. I also believe this year’s main Rutas del Inca offering has managed to improve from last year’s. 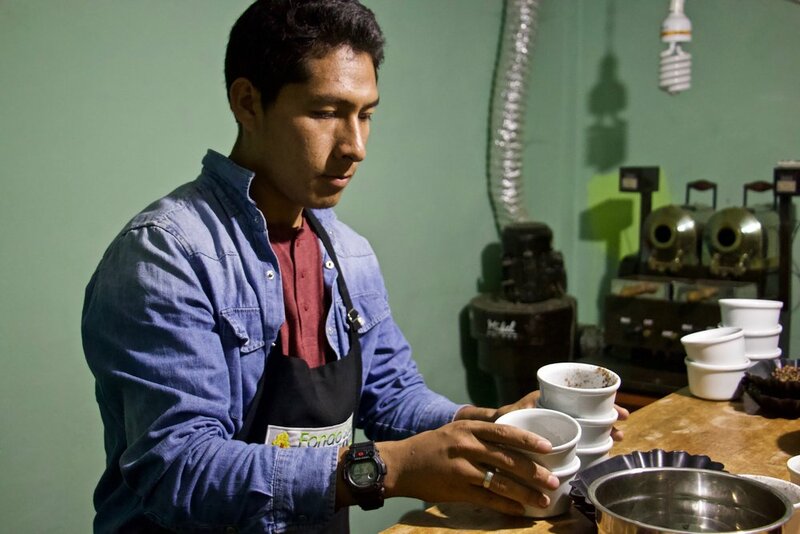 We are excited to again share coffee from Rutas del Inca in early 2019!